Romance of the Three Kingdoms, written by Luo Guanzhong in the 14th century, is a Chinese historical novel based upon events in the turbulent years near the end of the Han Dynasty and the Three Kingdoms era, starting in 168 AD and ending with the reunification of the land in 280 AD. Yokoyama Mitsuteru's adaption begins from the decline of the Han Dynasty until the fall of Shu-Han. Wow when I came to change my status of this manga I was surprised that nobody has written a review for this one so i thought hey I might as well. For those who don't know Sangokushi is based on Romance of Three kingdoms Story a Chinese classic and trust me when I say you will be able to tell it is a classic. 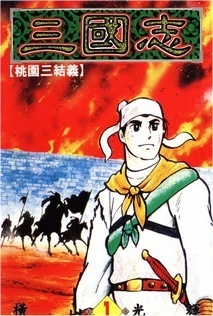 The main themes of the story are about honor glory and simple wars. But what really drives the story are the characters, all of them are great as for one they are all very famous and plus they all have great personalities that do get developed throughout the story which I guess if they didn't after 400+ chapters that would be pretty bad. Overall if you got a lot of free time and want to read a classic manga with a LOT of action (The whole story is basically a bunch of wars) then you will fall in love with is manga. Just also note that this manga does cover a whole dynasty so don't hold your hopes up to high when it comes to your favorite character living until the end of the story. But overall yes I would totally recommend this is you are looking for a good action packed manga though also since its old don't expect the action scenes to be to visceral like they are in something like Baki the grappler.